The Amazon Echo always seemed like a perfect device to use as an intercom within your house. 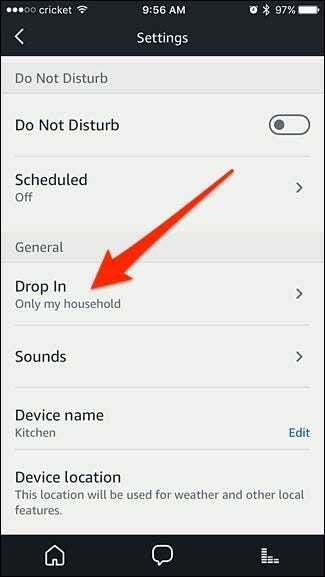 This is now a reality, as Amazon has released its “Drop In” feature on all Echo devices. Here’s how to set it up. 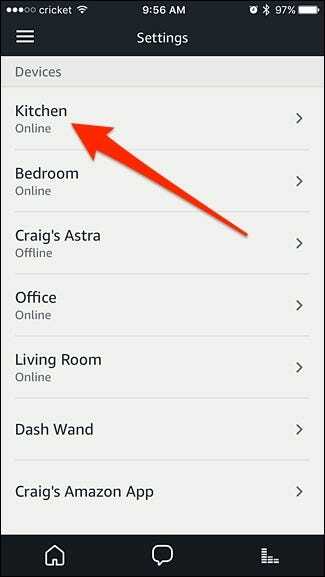 This feature works not only amongst your own Echo devices in your house, but you can also use it with friends and family if they have it set up as well. 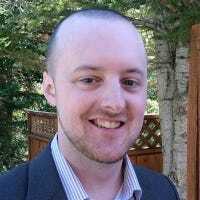 However, that means that those contacts can talk to you on your Echo without you having to “pick up” the phone—which can definitely be off putting for some. Thankfully, you have to allow certain contacts to Drop In before they can use the feature. You can also restrict Drop In to only Echos in your house, if you prefer, or disable it completely. 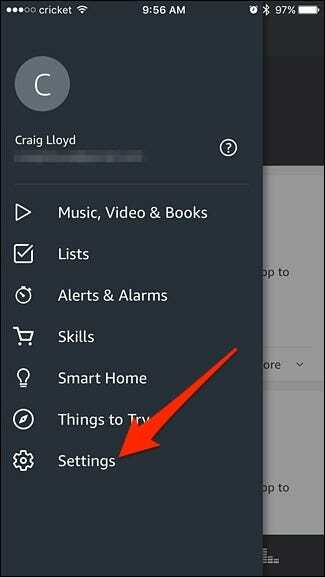 Before you start going intercom crazy, there are a couple of things you need to enable in the Alexa app first. 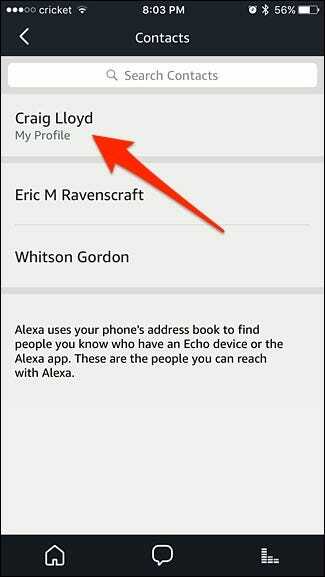 You’ll need to enable the Drop In feature on all of your Echo devices that you want to use it with. We found that it was enabled by default on all of our Echos (which, frankly, is a little annoying), but just in case, you’ll probably want to check. 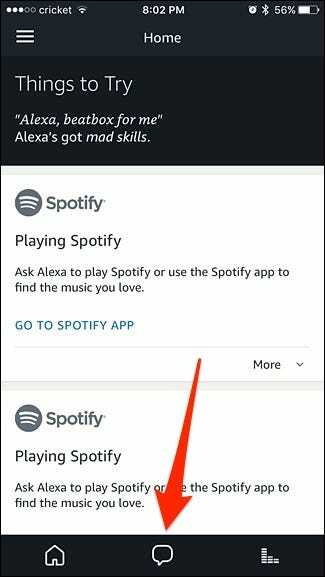 To do this, start by opening up the Alexa app on your phone and tapping on the menu button in the top-left corner of the screen. Select an Echo Device that you want to enable Drop In on. Scroll down a bit and tap on “Drop In”. Select either “On” or “Only My Household”. The latter option will only allow drop-in calls from your own Echo devices. You’ll need to enable Drop In for each Echo device, so repeat the above steps for every Echo that you want Drop In enabled on. 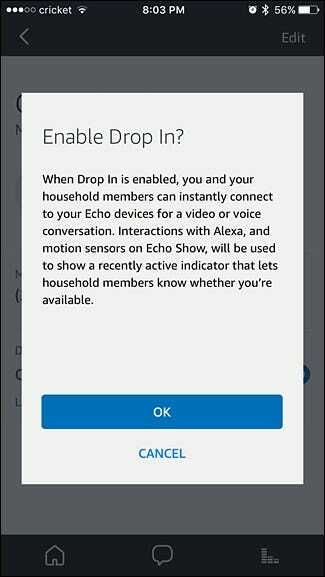 There’s one more thing you need to enable before using the Drop In feature, and that’s giving yourself permission to drop in on your Echo devices. It’s kind of weird and doesn’t make much sense, but it’s required before you can begin using the feature. 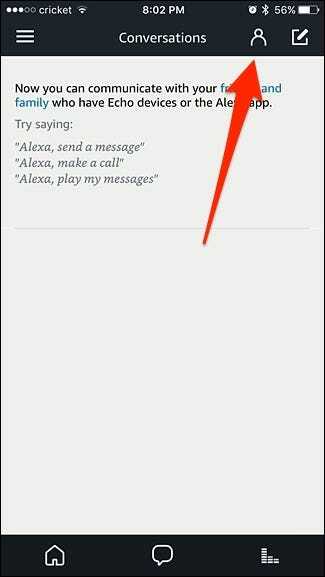 To do this, open up the Alexa app and tap on the Conversations tab at the bottom if it isn’t already selected. Tap on the Contacts button up in the top-right corner. 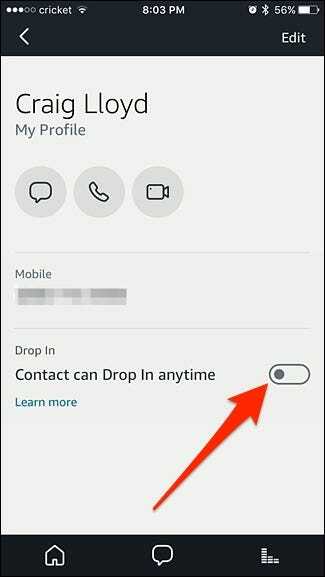 Tap on the toggle switch next to “Contact can Drop in anytime”. When the pop-up window appears, tap on “OK”. This is also the same setting that you would enable for other contacts, giving them permission to drop in on you whenever they want, only you’re enabling it for yourself. If you have multiple Echo devices in your household, you can use them as an intercom system of sorts, allowing you to talk to someone from across the house. To do this, simply just say “Alexa, drop in on Kitchen Echo”. You’ll need to say the name of that particular Echo device, so if it’s called “Living Room Echo”, you’ll need to say “Living Room Echo”, although I’ve gotten away with just saying “Living Room”. Once the connection is established, you’ll immediately begin hearing the other end and you can begin talking to the other person. There are no buttons to push or anything, as the microphone is hot for the entire duration. If you don’t want to simply drop in and immediately begin chatting, you can still perform a normal call and have the Echo ring first, requiring the person on the other end to answer. 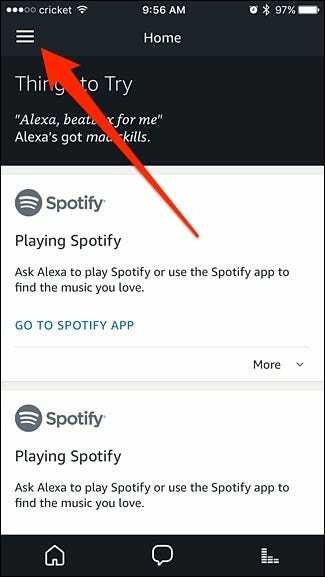 To do this, just say “Alexa, call Kitchen Echo”. At the end, whether it’s a drop in or a call, just say “Alexa, hang up” and the communication will end. 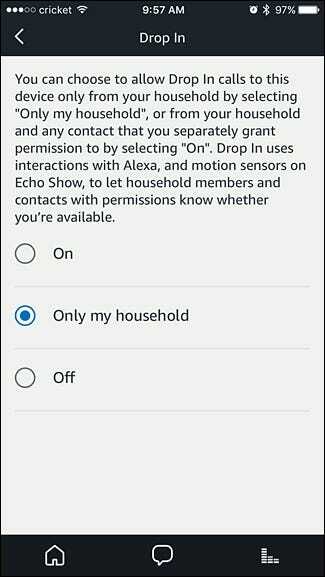 Of course, you can also drop in on other contacts that aren’t in your household by saying “Alexa, drop in on David”, but it only works if they’ve enabled Drop In for you and have given you permission.